The following is an essay about art and architecture that I wrote for TREMORS Magazine earlier this year. It was time to be more critical about the urban installations I proposed at the Architectural Association, so I wanted to link together urbanism with the idea of institutional critique, and the modular nature of my structures with the practitioners of Minimalist sculpture such as Donald Judd. In the aftermath of the social, political, and technological upheaval in the early 21st century, the city is freed from its servitude to premeditated patterns of behaviour. These speculative urban installations address two parallel currents in contemporary art – the growth and construction of the immersive environment, and the mode of production of the urban project in the public realm. 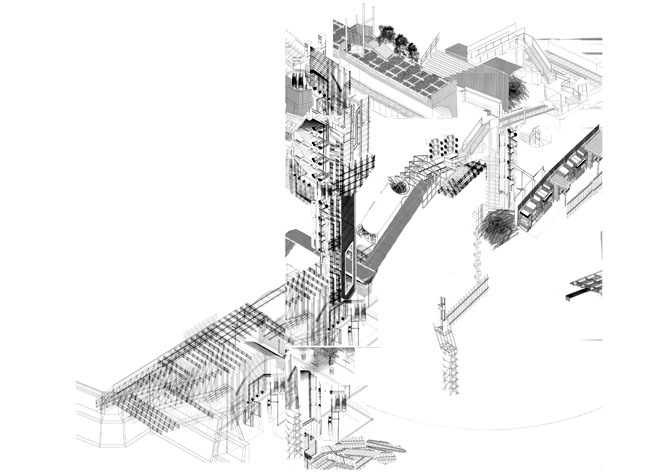 Through an integrative practice that makes sculptural form and critical discourse into a single continuum, the Metabolic Bridge, Thames Platform, and Oblique Landscape are an attempt to channel our post-millennial freedom into a new method of expression. A reappraisal of the Minimalist “method” of repetitive practice is needed to counteract the vacuous identity production of the egocentric, self-mythologizing, and capricious artist-celebrity. By method, I simply mean an approach whereby a certain discipline is sustained over a series of repeated executions, sustained long enough to leave a trace of a system in the work and for that systematic quality to serve as a marked rhetorical feature of that work. Studio Olafur Eliasson’s slogan as a ‘laboratory for spatial research’ exemplifies the desire to return to a system of artistic experimentation that offers quasi-scientific objectivity. This form of practice, rooted in the prescribed and deterministic routines of the the American Minimalists of the 60s and 70s, managed to successfully invigorate art practice of the time by incorporating the range and scale of ambition that had until then been the sole province of architecture. Jameson uses the model of the Immanent Critique, Immanuel’s Kant analytic method where a field or discipline is analyzed using its own codes and systems of understanding. Whereas Modernist architecture, Cubist and Abstract Expressionist painting are seen as canonical innovations in art practice of the last century, these innovations still follow traditional, normative modes of production; all that has changed is the formal characteristics of the works themselves, as criticized from their own internal logic. In the aftermath of the Soviet Union and in the presence of heavily mediated Democratic politics, we have grown to distrust idealism of any sort. In doing so, we have excluded both Utopian text and impulse from contemporary discourse on artistic production and on the allocation of public space. However, the Utopian form and impulse has not disappeared, but have been invisibly subsumed into two complementary modes of artistic practice that emerged during the 20th century – the Installation and the Institutional Critique. 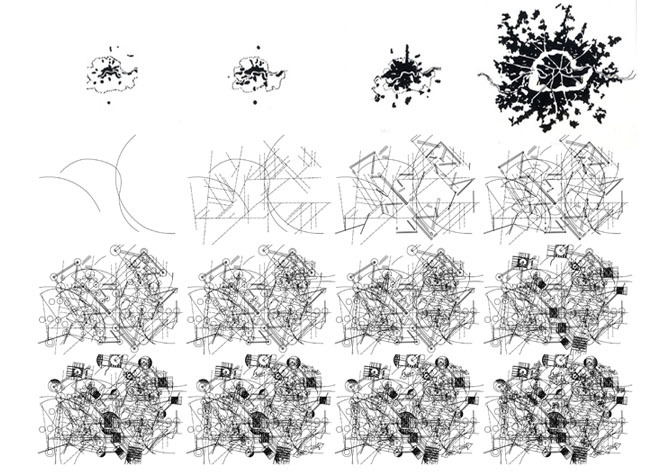 Utopian form has been translated into the Installation, where the introduction of a new set of elements within a relatively larger environment completely changes our perception of the entire system. Kurt Schwitter’s pioneering ‘Merzbau’ project emerged as a result of sculptural practice being confronted with the subversive and disorienting impact of collage and Cubist painting. 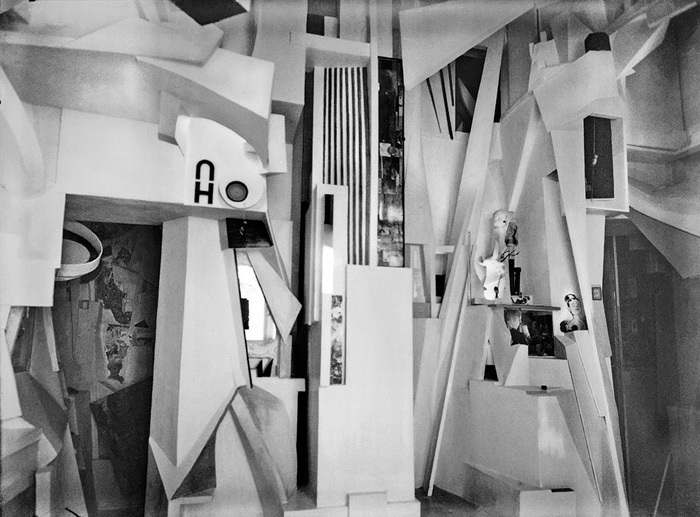 The Merzbau’s world-within-a-room is pivotal in defining the installation as a spatial assemblage in which the composition of an environment replaces the focus on singular art-object itself. In this sense, it is a practice without a specific medium, rather it is a method of constructing an alternative reality through tangible media. It is Utopian form, miniaturized and concentrated. If we are to take this idea outside the four walls of the gallery, the urban installation could act as a public agent provocateur, showing how the city might become. The Utopian Text, the intellectual counterpart of impulsive and instinctive practice, has become the Institutional Critique. Under the trickster spirits of Hans Haacke and others, the language of aesthetic production is no longer paint or stone but becomes a self-conscious questioning of the provenance of art itself – a method directly descending from Kant’s Immanent Critique. While Haacke questioned the very foundations of the art-cultural complex and its role in whitewashing politicians, capitalism and war, the Institution that the urban installation deals with is the City itself. 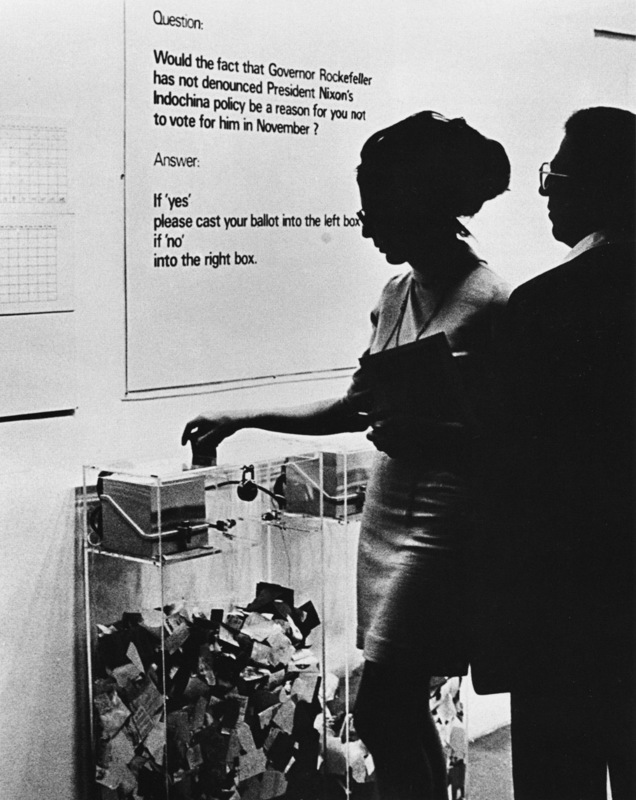 ‘Information’, an exhibition at the Museum of Modern Art in 1970, by Hans Haacke. New York Governer Nelson Rockefeller was a member of the board of trustees of MOMA and planning a run for the U.S. Presidency at the time. 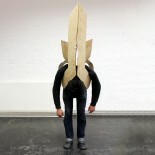 How, then, should the City be critiqued? In the context of London, infrastructure and public space are the physical realization of economic and political will, driven through the fabric of the city. While the British government provides ostensibly public urban developments to whitewash the impact of an unstable economy, costly war, and political corruption, the City is a more complex institution that calls for a new mode of critical practice and aesthetic objectivity. Within the expanse of London, any intervention, architectural project, public installation or social sculpture is at best a fragment of a larger dream. If we consider the infrastructural and spatial conditions of the city as a found object on which to operate, then all the raw materials required for our new urban installations already exist, stockpiled and overflowing. As a method of composition, the installations use a material matrix, a tool borrowed from architectural design, manipulated with the help of formal instructions from digital computing (code, keystrokes, calculation). Sculptural expression becomes possible through the spatial variation on the physical materials involved (shape, scale, orientation, number, density, weight), and the performance of the installation is governed by variations in its physical and social site. The task of the artist in the urban realm is no longer representational but involves the installation of specific objects within the city, creating a microcosm of Jameson’s Utopian form and Utopian text through the medium of constructed public space. In the next three posts, I will write about the selected projects in more detail. Also, check out this interview with TREMORS editor Maksymilian Mickiewicz at Dazed Digital. This entry was posted on October 13, 2012 by exilliteratur in Architecture, Art, Design, Essay, Installation, London, Technology and tagged architecture, critique, donald judd, drawing, essay, hans haacke, installation, kant, lawrence lek, london, merzbau, micro city, minimalism, minimalist, public art, schwitters, urbanism.